warning This application is not supported on IE versions lower than IE10. Open the Editor window from Sahi Dashboard. Search for the scenario file to be edited in navigation panel. Click on the file name to open the scenario editor. 1 Insert a new testcase. 3 Show function details for the selected cell. 4 Allows to import multiple functions at once. 5 Load Sample excel file. 6 Load Sample scenario file. Java Class should implement SahiMarkerInterface. 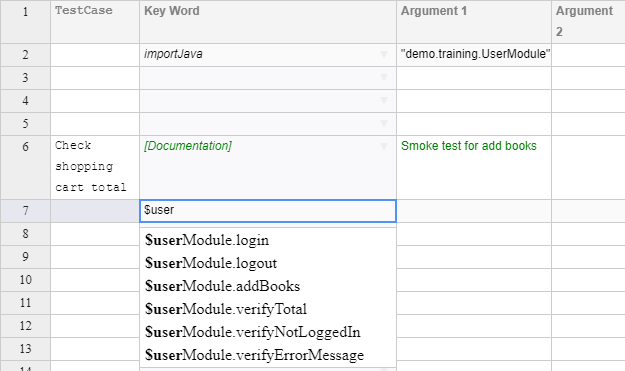 Add an import statement import com.sahipro.lang.java.client.SahiMarkerInterface;. The UI contains a button on the top of the editor called "Function Details". Selecting a cell and clicking this button gives details of the selected function and its arguments. This gives a basic idea as to what the type and number of arguments are. 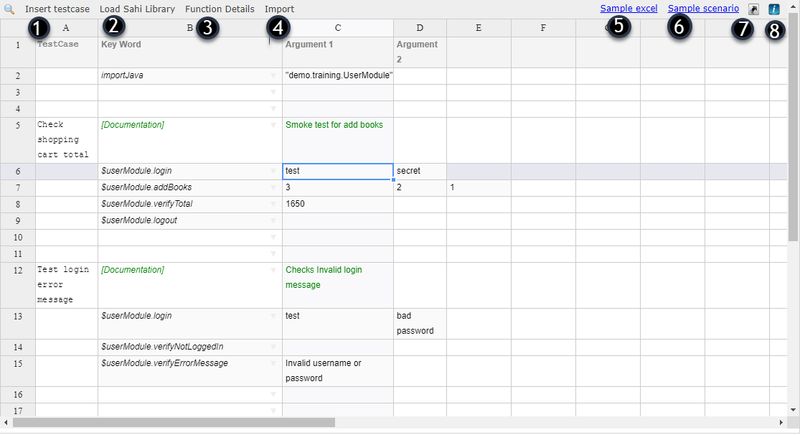 The SpreadSheet UI notifies the user about mistakes by marking problematic cells in red color. If the user adds a wrong function, i.e. a function that is not defined in the included files, or if he makes a mistake with the function name, the name appears in red. 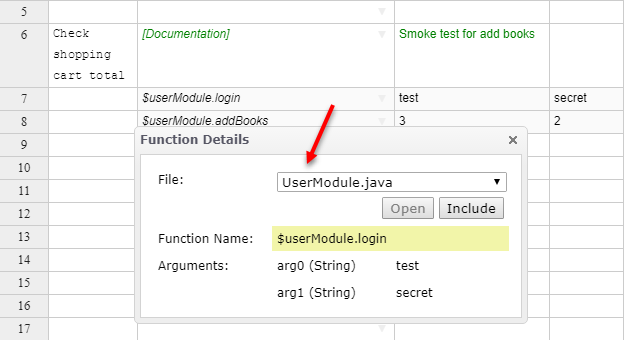 Only if the function is defined in the file included through 'importJava', does it appear in black. 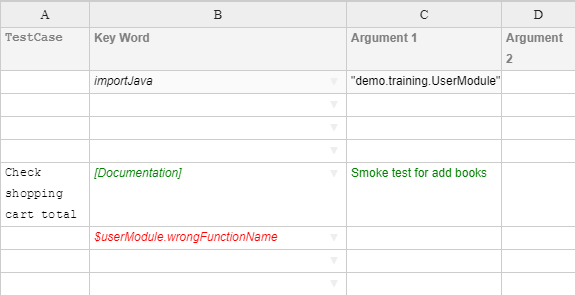 If the number of arguments added in the UI for a function is more than the number of arguments in the function definition, the extra arguments are shown in red. CTRL + HOME Move to column header cell. CTRL + C Copies the selected cells. CTRL + X Cuts the selected cells. CTRL + V Pastes in the selected cell. CTRL + Y Repeats the last command or action, if possible. CTRL + Z Uses the Undo command to reverse the last command or to delete the last entry you typed. CTRL + / Comment/ Un-comment the selected row/s. CTRL + DELETE Deletes the selected row/s. ALT + N Loads the new worksheet. ALT + O Opens the dialog to load existing scenario. ALT + SHIFT + E Displays the names of the feature developers. ALT + INSERT Insert Testcase shortcut. ALT + S Load Sahi library shortcut. ALT + 1 Insert new row above the current row. ALT + 2 Insert new row below the current row. SHIFT + F10 Displays the shortcut information pop-up. SHIFT + ARROW KEY Extends the selection of cells by one cell. DOWN ARROW Selects the next command when a context menu or Auto-complete option is open. UP ARROW Selects the previous command when a context menu or Auto-complete option is open. BACKSPACE Deletes one character to the left in the Formula Bar. Also clears the content of the active cell. DELETE Removes the cell contents from selected cells. In cell editing mode, it deletes the character to the right of the insertion point. END Moves to the last cell in the same row. Also selects the last command on the menu when a menu is visible. CTRL + SHIFT + END Extends the selection of cells to the last used cell on the worksheet (lower-right corner). ESC Cancels an entry in the cell or Formula Bar. It also closes an open menu dialog box or message window. HOME Moves to the beginning of a row in a worksheet. Selects the first command on the menu when a context menu is visible. PAGE DOWN Moves to the last cell in the same column. PAGE UP Moves to the first cell in the same column. TAB Moves one cell to the right in a worksheet. Moves to the next option in the context menu. SHIFT + TAB Moves to the previous cell in a worksheet.